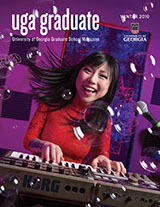 The University of Georgia, the University of Florida and North Carolina State University were recently awarded a grant to develop a strategic and systematic intervention for doctoral completion in selected science, engineering, math, social sciences and humanities departments. Current admission, orientation and integration practices are being collected and analyzed. Additionally, a database system for monitoring doctoral completion in all graduate departments at the three institutions is being created. Based on findings from this study, a delineation of “best practices” for doctoral completion is being constructed. Furthermore, an online support forum for students will serve as a problem solving mechanism for doctoral completion. This proposal is submitted to request continuation funding during Phase II of the Council on Graduate Schools Ph.D. Completion Program. Through its Phase I accomplishments, the Graduate School at the University has laid the groundwork for campus-wide improvements with respect to doctoral completion. Our proposed efforts in Phase II will allow us to apply the “lessons learned” working intensively with twelve programs to improving doctoral completion in the 78 doctoral programs at the university that, to date, have not been included in our program improvement efforts.